BonitaFloors.com Library - Hardwood Flooring Florida: Solid Or Engineered? The type of subfloor you have usually dictates what hardwood can be used. In Southwest Florida most of our subfloors are concrete. Considering much of our construction is done with concrete slabs, traditional 3/4" solid hardwood, commonplace up north, creates problems with vertical height differences. Solid hardwoods need a wood subfloor base to attach to. In doing so, the overall vertical height of the new floor can be as much as 1 1/2 inches. More on solid hardwood floors over concrete. We hear it all the time: "It's too humid in Florida for hardwood floors." When you really think about it, how often is it humid inside your residence? 7-8 months out of the year we run the air conditioning non stop. Depending on what type of system you may have, central air conditioning keeps the humidly level consistent, or in the safe range for hardwood floors. In the cooler winter months when air conditioning is not used as often, Florida rarely sees humidity levels above 60% for any extended period of time. 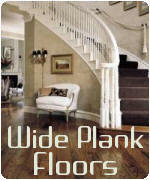 For more on the topics above check out "Are we ready for hardwood floors?" "I wonder if many retailers are just trying to get me to purchase from their MUCH wider selections of engineered products. Lots of them don't have much to choose from in solid wood"
"You are correct, many retailers only offer engineered products because they either feel more comfortable with it, or don't have the installers to handle other types of installations...."
Engineered hardwoods by far are more popular. Other advantages of engineered flooring include the wide array of selections available today. For example, if one desires a hand scraped look with a particular stain color we may have exactly what you are looking for in our showroom. At last count over 300 samples were available. Trying to duplicate or create a custom appearance can be costly and time consuming. Custom site finished floors, depending on the areas involved, can take one to four weeks to be installed and finished properly. For more desired results, the areas should be unoccupied without having any other tradesmen working.